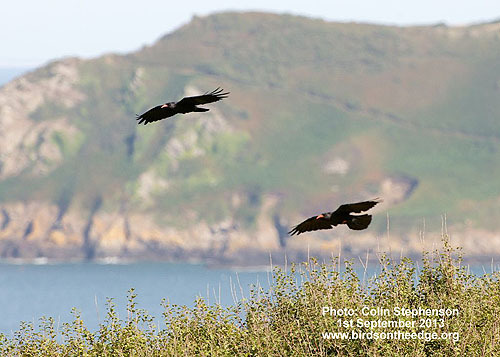 This year the project to restore the Red-billed Chough to Jersey took a big step forward – the species was seen flying over the coast for the first time in 100 years. 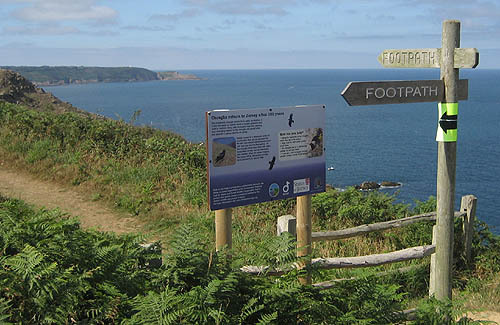 Six birds, bred at Operation Chough’s home, Paradise Park in Cornwall, were moved to a specially built aviary on the north coast of Jersey in March. Cared for by staff of the Durrell Wildlife Conservation Trust, the birds stayed inside for several months while they became familiar with their surroundings. Then, in August the hatches were opened for a short period each day. The birds finally had the opportunity for freedom! Some birds some flew out and quickly returned, some stayed in the aviary. 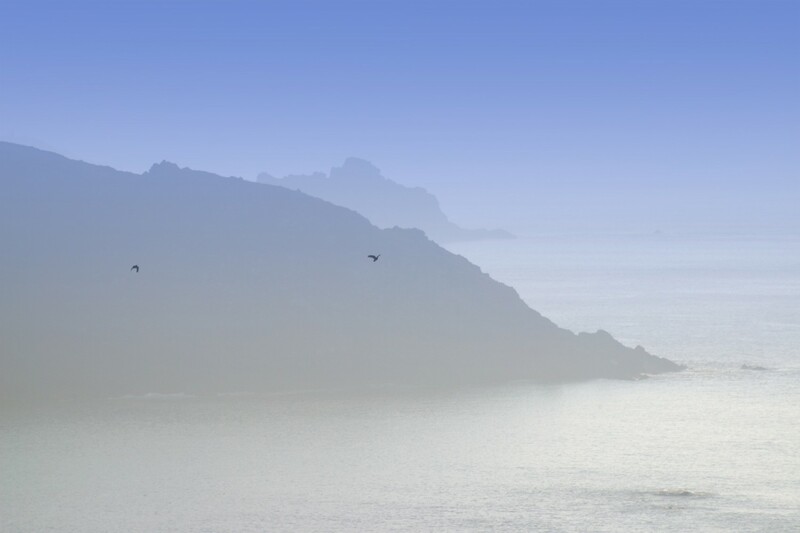 One pair flew around the coast to a quarry where they stayed for three days before returning. 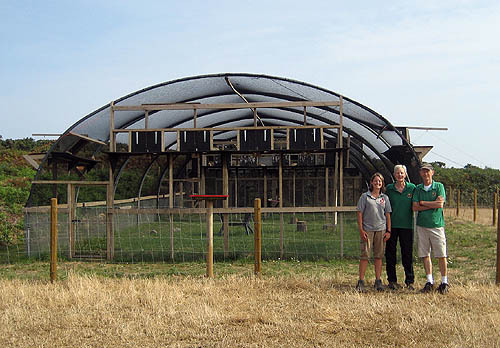 As a ‘soft release’ the plan was for the group to use the aviary as a base, so this was a good start. Liz Corry, Durrell’s ‘Chough Re-introduction Field Manager’, was responsible for the care of the birds. She had trained them, using positive reinforcement so they understand visual and audible signals to return to the aviary or go to targets for supplementary food. Daily monitoring, with the help of tracking devices, was used as every method was used to give as much support as possible as the birds got their freedom and faced new challenges. 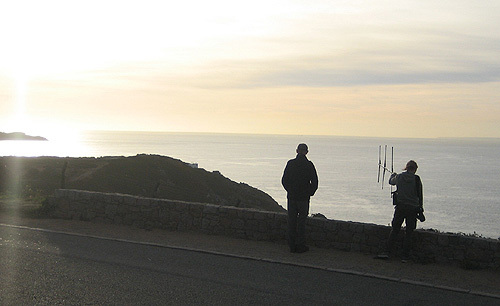 Conservation Biologist Dr Glyn Young from Durrell, wrote about the release on the Birds on the Edge website, “There was a heart-in-mouth moment when we watched a peregrine attack the pair but they recognised the threat and, in mid-air, on the longest flight of their lives fought it off… ”. Happily the choughs did not show any ill effects from this encounter. The choughs continued to explore the nearby coastal area, returning to the aviary for food and shelter when they could be closely watched and weighed. Sadly, towards the end of October, one bird was found dead and then another went missing. Losses have to be expected in a release project and hopes were still high as most of the birds were adapting very well. In December 2013 three new recruits joined the release project. All were bred at Paradise Park, two chicks and one older juvenile male. These young choughs went for their health check at the Durrell Vet Department, then on to the aviary at Sorel for their quarantine period. Although separated from the group which had already been flying free, the decision was made to keep all the birds in the aviary until the New Year. This would allow for the two groups to bond, avoid the worst of the winter weather and releases would restart as day length increased in 2014.